WHAT PRICE OUR NATIONAL PARKS? For anyone concerned about the future protection of our National Parks, as places where the diversity of fauna and flora would be protected and maintained in their natural condition to the greatest extent possible, the Newman Government’s move, in 2013-2014, to increasingly commercialise our Parks was one of the worst aspects of his three years in office. It was therefore a relief to hear promises from the then ALP opposition that the changes made to the Nature Conservation Act under Newman would be repealed if they won office. We were assured that the original definitions of the primary purpose of National Parks and the cardinal principle of their management would be restored in law. National Parks are owned by the people of Queensland and we have always maintained that the place for private tourism or eco-tourism facilities is outside their borders. By definition any facility constructed on land inside a National Park cannot be classed as eco-tourism (no matter how sensitive or sustainable) because it permanently alters and impacts on protected land. The recently announced plans will affect National Parks at Cooloola and on Whitsunday Island as well as Hinchinbrook and the same principle of keeping public lands in public hands and retaining the integrity of the Parks applies to all three. For more information I urge you to read the statement of Queensland’s National Parks Association, available here. With regard to Hinchinbrook’s world famous Thorsborne Trail, the government’s proposals to allow construction of private accommodation at 3 points along what was, and is, designated as a remote, wilderness trail for self-reliant walkers, simply in order to allow paying customers of a private company “to have their trail and comfort too” AND to provide public money to assist this privatisation while the disgusting remnants of the failed resort at the island’s Cape Richards are left to rot and pollute … well, it just beggars belief. And it is most unlikely to end there. Once a private company has invested money in an enterprise, and is essentially in partnership with Government, there will inevitably come more demands – for greater access, greater numbers, more facilities, increasing modification of the track to make it easier (or reduce the damage arising from greater numbers), provision for additional “recreational activities”, and so on – and the public will have no control over how the lease conditions are varied or relaxed. 1. Sign these two petitions. The first is the most important as it goes to the Queensland Parliament. You must be either a Queensland elector, a Queensland resident OR a Queensland citizen (or all three). You need to give your name, street address, email and phone number but none of this is publicly visible. Please sign it here and share with others. The second was posted on change.org a couple of weeks ago and has already garnered 10,000 signatures – and climbing. Anyone who cares about maintaining the integrity of our parks can sign this, no matter where you live. As above, please sign and share. If you want to go a step further please ask us for the contact details of Premier Palaczszuk or Environment Minister Leeanne Enoch – or they can be found on this website. 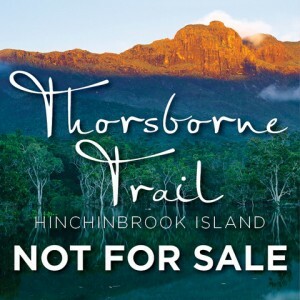 Hinchinbrook’s value lies in its wild and undisturbed beauty, the mystique of mountains and hidden valleys, its green cathedrals of forest and the aura of its ancient past …. Not everyone will be able to see and experience it for themselves …. but the knowledge that such sanctuaries exist – remote, beautiful, inviolable – brings a reassuring feeling of serenity and peace, elusive and precious qualities in the world today.